One of the things I have enjoyed about Australia is the way that everyday nature is so different from home. This might seem strange to an Australian, but I love looking at gum trees of all kinds, not because I’m looking for koalas – which I’ll admit, sometimes I am- but because I love beautiful trees, and these are all so different from the ones I am used to. We have a running joke that Australia is teeming with “Dr. Seuss trees” because of their windswept nature, long trunks and bushy tops. Truffulas anyone? The different types of the tropical birds are also truly a treat. I aspire to learn more about the birds here, which include parrots, cockatoos, lorikeets, and of course kookaburras. I was fortunate to grow up with a backyard full of bluejays and robins, and love listening to birdsongs. You’d think that the most distinguishing thing about a kookaburra would be it’s wild laughing call, which sort of sounds like hysterical monkeys, with an incrediblly loud oooo-ooo-hoo-hoo-ahh-hahhh-ahh from the predawn hours into dusk. This was in fact a shock, but one I was prepared for – especially given its name…. So what have we learned since? How to scare a kookaburra in mid-flight and save our bacon! Ha! 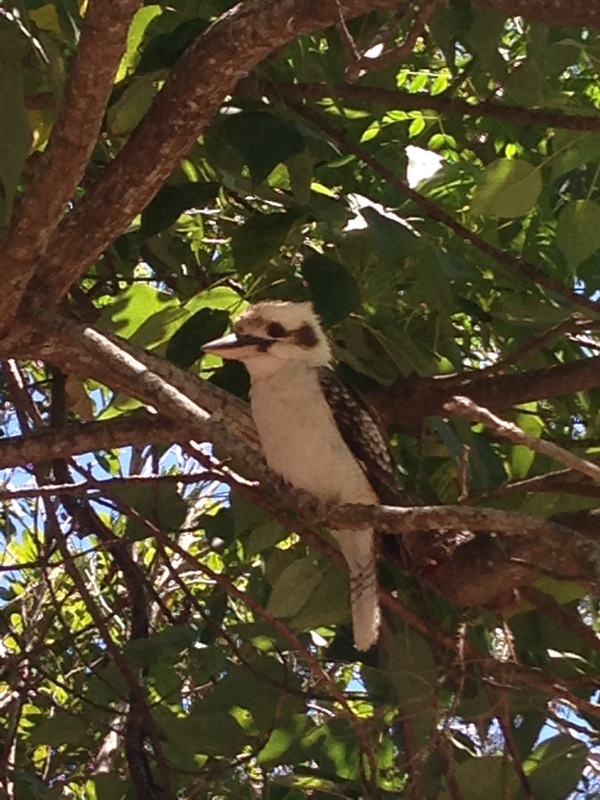 A quick update to this… As if this blog was a challenge accepted, yesterday a kookaburra swooped down and took half a piece of sausage from my plate! Before I could do anything he was perched in a branch above me, laughing!